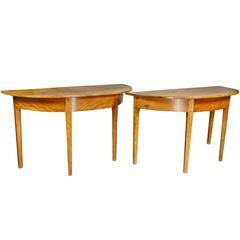 Pair of solid wood, hand-carved Serge Roche demi-lune console tables. Perfect example of Hollywood Regency / Dorothy Draper style. Each table mounts to wall with built in wood cleat, and stands 34.75" tall. Very good condition with very minor wear consistent with age. 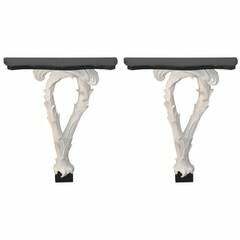 Fabulous pair of large Serge Roche hand-carved plume wall shelves in iconic Dorothy Draper style. Excellent condition with almost no flaws to the newly lacquered black and white finish. Faux bamboo console table features beveled glass top insert and carved wood gate details. Excellent condition with very minor signs of age appropriate use. 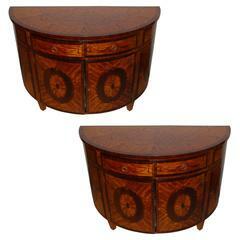 Small pair of console tables unusual demilune wall-mounted shelves, cirac 1890-1900 Walnut Each with a single drawer. 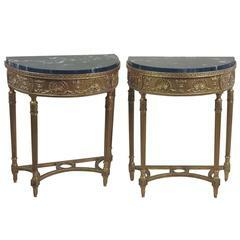 Pair of 19th century English painted demilune console tables, 1840. Dimensions: 47 inches (119 cms) wide 23 inches (58 cms) deep 28 inches (71 cms) high. Pair of early 19th century painted demilune console tables, 1820. Dimensions: 57 inches (145 cms) wide 23 inches (58 cms) deep 29 inches (74 cms) high. Elegant lines, distressed wood and beaded apron, circa 1810-1820. Sold and priced as pair only. Pair of Neoclassic plaster consoles.